Each October I go a little Pumpkin Crazy. One of the things I make from scratch is Pumpkin Butter. There is no butter in Pumpkin Butter. It is like Apple Butter, which is like spreadable apple sauce. When I make a batch and give it out, I always get requests for more. So here is my recipe. 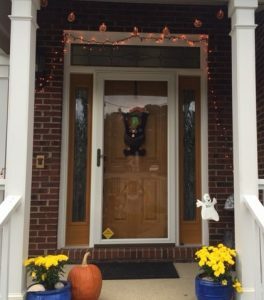 It’s really not too hard, and people are fairly impressed that it comes from real pumpkins! I don’t just use it for spreading on toast. I add it to oatmeal as a pumpkin flavored sweetener and to pancake batter for instant Pumpkin Pancakes. Try it out. You’ll love it! 1. 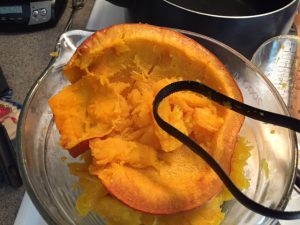 Wash pumpkins, carefully cut stem off and cut in half. Scoop out seeds and scrape out threads. 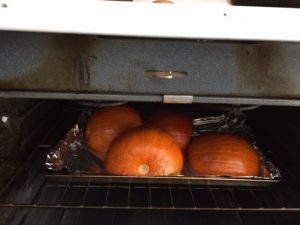 Save seeds to roast later. 3. Let cool to touch and scoop out soft pumpkin. You can puree it now or after it’s been in crock pot. 4. 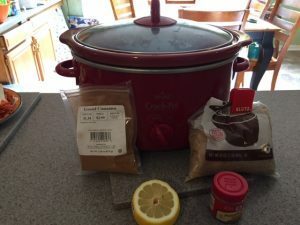 Place in crock pot, add all other ingredients and cook on LOW for 2 hours, stirring occasionally to make sure it’s not sticking to sides. 5. Use immersion blender or potato masher to make the butter smooth. 6. Place portions into clean jars or freezer bags. 7. Keep refrigerated or frozen. Canning is not recommended. Use willy nilly on everything that could use some sweet pumpkin flavor! Interesting concept. Thank you for the recipe. There are so many new ideas for pumpkins this year. What fun! Thanks for sharing! 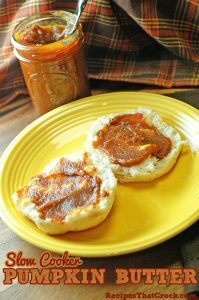 I love honey butter and apple butter but never tried pumpkin butter. I just recently found pumpkin chips (kind of like tortilla chips but pumpkin). Interesting recipe. I’ll have to try it. Sounds interesting! My family loves to try new things! This is great. Thanks for sharing this Heather. I’ll be tryingthis. I’ll be trying this. Thanks!